One million students drop out of school each year, and half of those dropouts come from just 12 percent of schools. City Year’s Long-Term Impact strategy will challenge the status quo, dramatically increasing the graduation pipeline and transforming the future for thousands of students in America. City Year’s mission is to build democracy through citizen service, civic leadership and social entrepreneurship. It is through service that we can demonstrate the power and idealism of young people, engage citizens to benefit the common good, and develop young leaders of the next generation. Students who progress to 10th grade with their peers are four times more likely to graduate than students who fall behind. Our Long-Term Impact goal is to ensure 80% of the students in the schools City Year serves reach 10th grade on track and on time, and to serve the majority of at-risk students in the locations where City Year serves. City Year will focus that service in the communities where the dropout challenge is most concentrated, ultimately serving in the cities that account for two-thirds of the nation’s urban dropouts. Students at risk of dropping out can be identified as early as elementary school by three early warning indicators known as the ABC’s: poor Attendance, disruptive Behavior and Course failure in math and English. 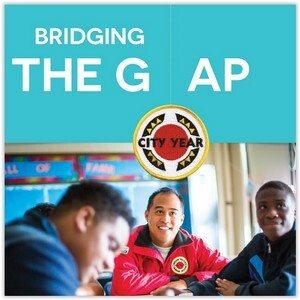 City Year partners with public schools. We provide the extra people power to help schools implement intervention research shows to be effective, for the right students at the right times. By focusing our work in 3rd-9th grade, we provide a continuum of care, and saturate feeder patterns so students who need help receive multiple, consecutive years of interventions and supports. Our Long-Term Impact strategy will ensure students have an opportunity to improve their performance that couldn’t be achieved by focusing on a single grade or single intervention alone.